Simple yet functional, the LUXA2 PA3 is the ideal choice of people who prefer clean cut design and practical function. The strap design at the middle of the case is the most convenient function to pull the iPad out of case swiftly and easily. 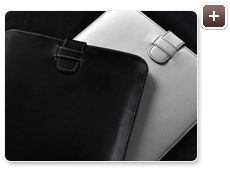 No more complication design and bulkiness, the LUXA3 PA3 iPad Leather Folio Case is stylish and convenient. With leather and the classical Black and White colors, it is definitely hard to reject it. Adapting 100% calf skin and line texture design, the PA3 is sending out the message of good quality and taste. The overall design looks elegant, classy and yet sturdy. The PA3 is sleek and chic, therefore it is easy to carry it out or slide it into your carrying bag. Not wasting unnecessary spaces, the case is thin enough for putting into your carrying bag. The strap removal design is one of the highlight of this case. 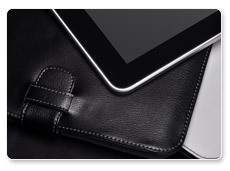 Most of the cases on the market are too tight and troublesome to pull out the iPad. 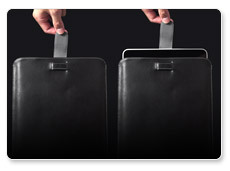 With the strap design, all you have to do is to pull the strap upward and then the iPad is out from the case accordingly. Swift and easy! 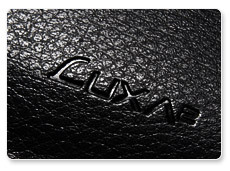 The LUXA2 PA3 is designed with the classical Black and White colors, which is also the most elegant and mature choice.